The Württemberger, known in Germany as the Dreifarbige Württemberger or Dreifarbige Württembergische Vorstehhund, was a short-haired, tricolored pointing dog that disappeared just after World War I. Exactly where, when and how it came to be is the subject of speculation. The most common assumption is that the breed was developed in the Württemberg region of southwest Germany in the 1870s. Some sources claim that Gypsies traveling from Russia brought it to the Kingdom of Württemberg in the early 1800s, but others insist that it was an ancient breed, known in southern Germany for centuries. Whatever their origin, heavy, tricolored pointing dogs were present in large enough numbers in the 1880s and ’90s to catch the attention of Germany’s Delegate Commission which, for a time, recognized them as a breed. But no separate stud book was ever created for Württembergers and they, along with Weimaraners, were registered in the German Shorthaired Pointer stud book. Apparently a Tricolored Shorthair Club (Dreifarbige Kurzhaar Klub) was formed in Germany, but its efforts to gain official recognition for the breed failed. It is not clear exactly why, but it may have been due to the fact that many of the leading dog experts of the time believed that any tricolored coat had to be the result of crossbreeding to either Gordon Setters or some kind of hound, such as the Large Blue Gascony and therefore the breed could not be considered 'pure'. Physically, Württemburgers were fairly large dogs, up to 70 centimeters at the shoulder with a large head, heavy flews and loose skin. They probably looked like a tricolored Bracco Italiano or Burgos Pointer. A fairly detailed description of the breed was written by J.B. Samat and appears in the book Les Chiens de Chasse, published by the Manufrance company in the 1930s. The Württemberger has not yet undergone the same transformation as the real German Shorthaired Pointer which, nowadays, looks nothing like its ancestors. The Württemberger is a fairly tall dog with a heavy appearance, but it is rare to see a well-built and absolutely correct example, for the hunters in Württemberg are not very fussy and have no particular interested in a carefully thoughtout breeding system. However, there are two or three large kennels where the breed is carefully raised and where they have probably been improved in the same way as the other German breeds. The coat is tricolor marked with brown and tan spots and streaks on a blueish background, white with brown ticking with yellow markings above the eyes, on the cheeks, the edges of the ears, the lips, the chest, the inside of the legs and the underside of the tail. Other descriptions and images appeared in the late 1800s and early 1900s in sporting journals such as Le Chenil in France. In the book Die deutschen Vorstehhunde, author Manfred Hözel states that the last litter of Württemberger pups was whelped near the city of Nanz, Germany in 1910 and that two pups were “exported to America”. Other authors, however, have written that the breed managed to survive until just before the Second World War. The low-lying, sparsely populated regions of northwestern Europe have been the birthplace of several of the gundog breeds that we know today. Most are long-haired pointing dogs that developed from a common rootstock of so-called chiens d’oysel. One breed, a handsome black and white gundog, is named for the area in which it was developed—the marshy plains surrounding the city of Münster, Germany. It is the Grosser Münsterländer, known to the English-speaking world as the Large Munsterlander, and often referred to as the LM. their breed standard. Ten years later, hunters who had continued to breed black and white dogs despite the ban formed a new club specifically for the “pure breeding of the long-haired, large, black-and-white Munsterlander”. *Details of how and why the decision was made to remove black from the standard are given in the German Longhaired Pointer chapter. In 1922, the club began holding breed-specific shows and performance tests. However, independence for the new club did not last long. In 1933, with Germany under Nazi rule, it was forcibly amalgamated with the club for the German Longhaired Pointer. Studbooks were, however, kept separately. Out of disagreements, a second club was formed and two Large Munsterlander clubs existed side-by-side until 1969. This two-track organization was a disadvantage for the breed. For example, an exceptional performer "Kapp vom Langenshof" took second place in a demanding national test for all breeds where only 13 of 19 dogs passed. Kapp's brother "Keck" was also much praised. However, because of strife among club members these two dogs were only rarely used for breeding. Finally, in the early 1970s, the two Large Munsterlander clubs agreed to join forces. With renewed vigor, they succeeded in expanding the breed’s population in Germany and beyond. The first Large Munsterlanders were exported to the U.S. in the mid '60s and to the UK in the early '70s. Today the Large Munsterlander is well known in many parts of the world and enjoys an excellent reputation as an eye-pleasing, easy to handle, hard hunting all-around gundog. Looking back on all the years I have spent traveling to hunt with and photograph various breeds of gundog, a handful of events really stand out in my memory. Two of them occurred on the same day on the vast prairies of Saskatchewan where I had travelled to hunt with Joe Schmutz and his small herd of Large Munsterlanders. The first memorable event starts out like the opening line of a joke: A Canadian, a German and a Frenchman walk into a bar... The bar—more of a restaurant, really—was on the main street of Gravelbourg, Saskatchewan. I was there with my friend, Yannick Molès, who had just arrived the day before from France. We had agreed to meet up with Joe Schmutz, then president of the Large Munsterlander Club of North America, so we could all go chasing huns and sharptails. Since Yannick and I had arrived a bit early for our meeting, we decided to see some of the sights of the small prairie town. As we wandered along Main Street, we discussed the upcoming hunt—in French. Entering a small shop, the owner greeted us by saying: Bonjour Messieurs, puis-je vous aider? (“Hello gentlemen, may I help you?”). We were stunned. There we were, in the middle of Saskatchewan, thousands of miles west of Québec and an ocean away from France, yet somehow the shopkeeper spoke...French? It felt like we were in an episode of The Twilight Zone, especially when we realized that everyone else in the shop was also speaking French. But there was a logical explanation. You see, the folks in Gravelbourg have been speaking en français ever since 1906, when French priests founded the town. And I am sure that Yannick and I were not the first visitors to stand slack-jawed upon hearing la belle langue way out there on the bald prairies. Once we had regained our composure, we met Joe for lunch, then headed out of town with a unique assortment of dogs: two Weimaraners, two Pont-Audemer Spaniels and four Large Munsterlanders. The action in the field was exceptional. We found huns, sharptails, pheasants and ducks. The dog-work was outstanding. I was particularly impressed by Joe’s LMs. They showed a thorough, steady search, charging into even the nastiest thorn bushes and thickest grass. They were strong pointers and natural backers. And it was the natural backing of Joe’s dogs that eventually led to the second memorable event. It was near the end of the day. The sky glowed with the rich red tones of what was sure to be a spectacular sunset as we enjoyed some homemade deer sausage and dark rye bread on the tailgate of my truck. As he packed up to leave, Joe decided to let all four of his dogs out to have one last chance to do their business before the long ride home. As Yannick and I gathered up our gear and readied the truck, the Munsterlanders ran through the stubble with Joe following along with his gun, just in case. Suddenly, Joe shouted, “Hey, guys!” Turning, we were greeted with a sight that has remained with me to this day. As the ripe orange prairie sun set over a stubble field stretching to the horizon, four Large Munsterlanders—one pointing, three backing— stood like statues as their proud owner moved in to flush. And where were my cameras? Packed away with all the rest of the gear, of course! I had managed to get some great shots of the dogs earlier on (one of them actually made the cover of Gundog Magazine) but when the perfect one-in-a-million shot basically lined itself up right in front of me, my trusty Canon and Leica were at the bottom of a camera bag. So, instead of taking photos of the event, Yannick and I just soaked it all in. We watched Joe move in for the flush. A single grey partridge burst from the cover. Joe fired. The bird flew on. Joe fired again. The bird flew on. Joe fired a third time. And the bird flew on, not a feather out of place. Throughout it all, the dogs remained rock-steady. And from what I could tell, the fact that Joe missed all three shots didn’t really bother them. I could only conclude that, in addition to being excellent all-around hunting dogs, Large Munsterlanders are also quite forgiving. If you tell the average North American hunter that you have a German Shorthaired Pointer or German Wirehaired Pointer, he or she will probably know exactly what kind of dog you are talking about. But tell that same hunter you have a German Longhaired pointer, and the response you are most likely to get is a blank stare follow by: “say what?” Yet, the German Longhaired Pointer is actually older than its Shorthaired and Wirehaired compatriots. It also has a strong and well-regarded club in its homeland, a growing population in North America and even a small but active following on the field trial circuit in the Netherlands, France and Spain. During the late middle Ages, long-haired hunting dogs could be found throughout most of the low-lying, marshy regions of northern France, Holland and western Germany, where they went by a variety of names—Chiens d’oysel, Épagneuls, Spionnen, Stöberhunde, or Wachtelhunde. and, from them, the English developed Setters. In Germany, the transformation of flushing breeds into pointing breeds happened somewhat later, and it wasn’t really until the mid-1800s that the idea of a national breed of long-haired pointing dog caught the imagination of German sportsmen. Like the national short-haired and wire-haired breeds that would be developed somewhat later, the German Longhair was created by blending local types of hunting dogs with breeds from other countries. It is likely that French épagneul breeds, English Setters and Pointers contributed to the mix and, according to some sources, even Newfoundland Dogs and Collies may have been added. Naturally, with all the mixing and matching going on, a variety of types emerged. The most common color was brown and white, but black and white and even tricolored coats were also seen. There was also a lot of variation in size and overall look. It soon became clear that if breeders wanted to establish a national breed of long-haired dog, something had to be done to standardize it. So, in 1879 a number of influential personalities met in Hanover during an exhibition hosted by the Vereins zur Veredelung der Hunderassen (Association for the Refinement of Dog Breeds) to come up with a standard. When the meeting concluded, a dog named “Mylord 1”, born in 1875 and owned by a Mr. Gustav Borcher from Brunswick, was declared the model for the German Longhaired Pointer, and a breed standard based on him was written. too “English” for some of the more patriotic breeders. Like their French counterparts, 19th century German hunters had a sort of love-hate relationship with all things English. Some liked the idea of using English blood even if it meant black coats. Others vehemently disagreed. In 1893, Club Langhaar was formed by Freiherr (Baron) Friedrich von Schorlemer-Alst, and others. They established the first field tests for the breed and, since they encouraged their members to select their breeding stock based on performance, not just appearance, they allowed black in the coat. But Club Langhaar was centered mainly in the Westphalia and Rhineland regions of Germany; it lacked the support of breeders in other parts of the country who eventually formed another club in 1897: the Verein Deutsch-Langhaar. The two clubs coexisted for a number of years and followed the same standard, with one large exception. Verein Deutsch-Langhaar rejected black in the coat while Club Langhaar allowed it, at least for a while. In 1908, Club Langhaar reversed its position and decided to no longer accept black dogs. In 1926, the two clubs merged to form the Deutsch Langhaar Verband. Throughout the early part of the 20th century, breeders in Germany continued to refine the German Longhaired Pointer. The breed soon gained a reputation as a tough-as-nails “forester’s dog”, an excellent water worker and a calm steady tracker of big game. But it never man- aged to gain the same level of popularity among German hunters as its Shorthaired and Wirehaired cousins. Like the Weimaraner, the German Longhaired Pointer was more of a niche breed valued for a slower, steadier style, strong protective instinct and “sharpness” on predators. But unlike the Weimaraner, it did not capture the attention of sportsmen outside of Germany until the 1970s, which was probably a blessing in disguise. Today, the breed is still mainly in the hands of hunters. It is thriving in its homeland and is gaining converts in many other counties, including the US and UK. Compared To German Shorthaired and Wirehaired pointers, German Longhaired Pointers are relatively rare, but I have actually come across a good number of them in my travels. I’ve seen some in Germany, the Netherlands, the Czech Republic, Austria, France, Spain and the US. And while I did see some variation among them in terms of look and working style, i found no difference at all where it counts the most—in their desire to hunt. 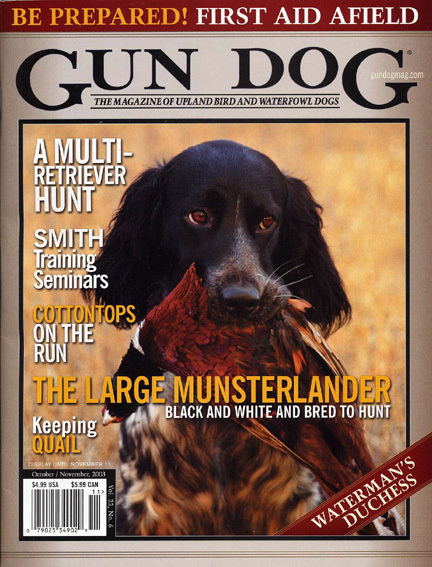 I first saw GLPs in Germany when I was there hunting rabbits and pheasants with a group of Weimaraner owners. There were a few GLPs in the group and they were quite impressive to watch. They hunted hard, pointed well and retrieved everything shot for them. On another visit to Europe, Lisa and I saw GLPs at field trials in the Netherlands and France. Overall, the quality of their performance was excellent. They ran fast, with a high head and pointed staunchly. What I saw confirmed what I had heard about Dutch GLPs. They were faster and wider ranging than the ones I’d seen in Germany. Despite these and other encounters with the breed in Europe, I could only guess at how they would adapt to conditions in North America. After all, I’d watched them hunting rabbits in the heather-covered sand dunes of an island off the coast of Germany—hardly woodcock cover. And, in the Netherlands, I saw them crisscross spring wheat fields bordered by busy freeways—not exactly Saskatchewan sharptail country. So, in 2009, when I got an offer to chase South Dakota roosters with a couple of GLPs, I hopped in the truck and headed south. I met up with Cortney Schaefer, her husband Scott, and father, Alan in the south central part of the state. For two days I followed along and photographed their GLPs in waist-high grass, along tangled tree lines and into cattail sloughs with knee-deep water. The dogs covered the ground at a good clip, not field trial speed, but a strong, medium gallop. They ranged out to about 100 yards, sometimes a bit more. Points were solid and productive. Their desire was obvious. The older dog—a five-year-old female—was like the Energizer bunny, never letting up no matter how long she was on the ground. Her ten-month-old pup had a nasty run-in with some barbed wire on the first day and, despite receiving more than a dozen stitches, spent the rest of the weekend trying to convince Cortney to let her off leash to get back into the hunt. As I drove home to Canada, I thought about the remarkable thing I had just witnessed. I’d seen German-bred GLPs help their American owners limit out on South Dakota roosters, in late November, on hard-hit public land! I guess my first impressions of the breed were confirmed in South Dakota: GLPs can be damn good hunting dogs. Among the most memorable conversations I’ve had with breeders were with the men and women who had dedicated much of their lives to the revival of a breed of gundog. And while the twists and turns are unique to each, there are certain elements common to them all: an extinct breed, a search to find any remaining stock, a declaration of rediscovery, initial resistance by the establishment and, eventually, acceptance of a re-established breed. When I first began my research, I thought that all the various breed revivals had taken place fairly recently, in the last half of the 20th century. However, it turns out that there was a man who revived a breed nearly a century ago. His name was Edmund Löns and the breed he rediscovered was a small, long-haired hunting dog that used to be common in much of northwestern Europe. Löns named it the Heidewachtel (Heath Quail Dog). Today, it is known as the Small Munsterlander. It is among the most popular gundog breeds in Germany and is quickly gaining popularity around the world. According to Edmund Löns, who wrote a book about the breed in 1912, they were owned by local farmers and peat diggers, men who saw hunting as a way of putting meat on the table and money in their pockets. To them, the real value of a dog was in the work after the shot, since any game not recovered was one less dish on the table or, worse, less money in their pocket. This kind of hunting survived until the early 1800s. By mid-century, an emerging middle class, and a shift in the attitude and practises of hunters, had all but wiped out the commercial hunter. New breeds of dogs and styles of hunting emerged. Setter and Pointers were imported from England and various épagneul breeds from France. As hunters mixed these breeds with local dogs, new varieties began to emerge. Eventually, the larger ones evolved into what would form the basis of the German Longhaired Pointer and the Large Munsterlander breeds in Germany, and the Drentsche Patrijshond and Stabyhoun breeds in the Netherlands. The smaller varieties, on the other hand, never really caught on. By the end of the 19th century, very few of the little Spionnen remained. In fact, most people considered them extinct. Then, in 1906, in what can only be described as a one in a million chance, they were rediscovered. in a tracking breed known as the Roten Hannoverschen Heidebracke (Red Hanoverian Heath Hound), which was also thought to be near extinction. Hermann wanted to find out if there were any still alive in Germany, so he published an appeal in a popular sporting magazine asking for anyone with information on the breed to contact him. The appeal must have produced a few leads, for it is said that Hermann and his brother Edmund traveled throughout Lower Saxony (northwestern Germany) in their search. What they found, however, was not the Roten Hannoverschen Heidebracke. It was something else altogether. It was the Spion; the small long-haired pointing dog considered by many to have gone extinct many years before. It turns out that the Spion had somehow managed to survive on a few isolated farms in the Westphalia region, where they were kept as tightly line-bred families. One of the breeders was a man by the name of Heitmann. According to Edmund Löns, Heitmann had been breeding his line of Spions since 1877 and had even used German Longhaired Pointers from time to time, keeping only those pups that had Spion traits. In 1911, Löns found another line of dogs with the same characteristics in the area of Dorsten, a town in Westphalia. The Dorsten dogs actually traced back to the same sources as the Heitmann dogs, but had not been crossed with them for many years. So Löns and Heitmann used them to strengthen the Heitmann line, and vise versa. Although there were differences in the two lines—the Dorsten dogs tended to be somewhat larger—both lines produced dogs with white coats and brown patches or plates. The roan color seen in the breed today came somewhat later. It was the result of early crosses to German Longhaired Pointers and, as we shall see, Brittanies. Some sources claim that the Small Munsterlander has been a pure breed for over 500 years. The evidence clearly indicates otherwise; it has only been recognized since the early 1900s, and has, until fairly recently, received infusions of blood from other breeds. As early as 1904, there was speculation that the Small Munsterlander was actually a local variety of the Brittany or, at the very least, a descendant of French dogs brought to Westphalia in the early 1800s by the soldiers of Napoleon’s army. Since Edmund Löns had served in the German army in France during the First World War, it was also suspected that he had bred French dogs into his lines. But Löns always maintained that the Small Munsterlander was a pure breed and that it had been around for centuries. However, in a recently revised and expanded edition of Der Heidewachtel, kleiner Munsterlander Vorstehhund oder Spion, a book that Löns wrote in 1922, Elizabeth Brand-Böhmer, a close friend of Löns, describes his attempts to develop the brown roan coat in the Small Munsterlander. It seems that Löns had tried crossing to German Longhaired Pointers, reasoning that they were from the same basic root stock. But he was never really satisfied with the cross which he found produced dogs that were too large and slow. Then one day in 1918, he saw a small, brown roan dog on a ragpicker’s cart near his home. Löns immediately recognized it as a Brittany and offered to purchase it on the spot. The owner refused, but Löns persisted. He even went so far as to secretly observe the ragpicker and his dog on the local heath. He saw that the dog would sit on the cart and then jump off to go hunting. Its quick pace, high nose and solid point impressed Löns enormously. Somehow Löns eventually purchased the dog and even had it registered in the Small Munsterlander stud book. When he used it for breeding and produced brown roan pups, Löns told club members that the coat was due to a genetic mutation. Later he changed his story and claimed that it came from a cross to German Longhaired Pointers. Inevitably, Löns was criticized for his breeding practises, and there-after remained silent on the issue. He did however confess to at least one person, Elizabeth Brand-Böhmer. He told her the story of the ragpicker’s Brittany, but asked that she not reveal it until after his death—which she did in 2006, having kept the secret for nearly 40 years. Prior to the establishment of a unified breed club in the 1960s, the breed went by two names. To the club led by Löns, it was the Heidewachtel, literally “Heath-land Quail Dog”. To members of the other club it was the Kleiner Munsterländer Vorstehhund, the Small Munsterlander Pointing Dog. Other names sometimes used were Spion or Spannjer. In Germany today, the official name of the breed is Kleiner Münsterländer. In English speaking countries, the breed is called the Small Munsterander, often abbreviated to SM. Interestingly, the breed is still called Heidewachtel in the Netherlands.